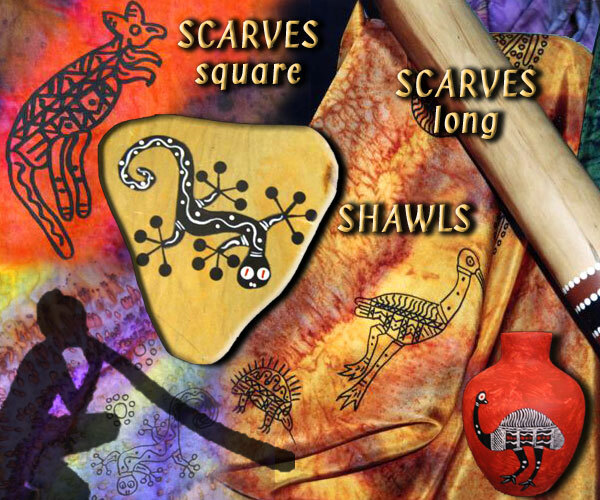 Australian Inland Aboriginal Silk Shawls and Scarves, hand painted wearable art. The Australian Aboriginal People create beautiful and intricate artworks. Our Aboriginal Art designs were created for us by talented Australian Aboriginal Artist, Tom 'Bagaay' Avery. His “inland Australian” designs feature the creatures of Inland Australia including the Kangaroo, Wallaby, Echidna, Emu, Jabiru, Platypus, Gecko and Goanna. Tom’s designs are hand printed onto lengths of pure white silk. The silk is then painted in the earthy colours of Central Australia and the Australian Outback.